The internet is filled with pictures, gifs and videos of people failing at life in some way shape or form. These can be Jackass style stunts, car dash cams or just people who have screwed up even the most basic thing to disastrous results while someone just happened to have their iPhone out. Facebook pages featuring these pictures gain millions of fans and the compilation videos on YouTube gain millions of views. There must be something inherently terrible about people that they enjoy watching others fail. But it doesn’t end there, after watching people fail, there is a next level of person who takes pleasure in the failures of other. That person is known as a Troll. 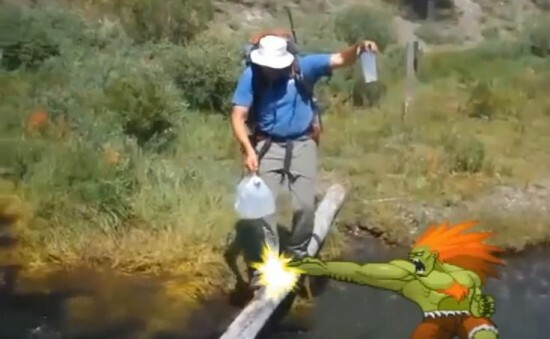 Launching a little over two months ago, Blanka is a Troll is a series of videos that put in sprites of everyone’s favorite electric green Street Fighter into these fail situations to hilarious results. Seeing a bride fall into a pool of water somehow becomes even funnier when it is Blanka who pushed her in. Watching a bunch of skateboarders bite it is even better when Blanka unleashed a bunch of pineapples in their path. As you’ll see in the video below, Blanka is a Troll shows just how terrible we can be as people and how we can make someone’s embarassing moment that much worse by immortalizing it and exposing it to millions of strangers online. How do you measure a year? Don’t worry, I’m not about to break out into song. But my answer does involve at least three of the hottest songs of the year. It also includes a dancing zebra, a man skydiving from space, some gamers and probably close to 1,000,000 calories. In just one day, YouTube.com’s year in review video has garnered more than 17,000,000 views (a number that will most likely be obsolete by the time this post even goes live). But the video isn’t just a compilation video or highlight reel. Take a peek below at the cast of YouTube celebrities brought together for this remix rewind of all of their top viewed trending videos. With over billion of views between the stars of the video (over 980,000,000 for PSY’s “Gangam Style” alone), some of these people who may not have ever graced a movie screen have become more recognizable than some television or big screen actors. Some of these people featured have found themselves on TV because of their YouTube fame including iJustine who appeared in the Call of Duty: Black Ops II “Surprise” trailer. It all started as a little, micro-budget horror flick 3 years ago, that has now become a phenomenon (pun intended) and one highly anticipated trilogy. Oren Peli’s Paranormal Activity is just that, and the viral marketing campaign for the upcoming third installment is just beginning. Over the weekend, several news outlets received a VHS tape and VCR in the mail that had some pretty scary stuff on it. Just enough to get you to pee yourself with both fear and anticipation for what the next film has to bring us. Here’s what we can look forward to in terms of a story. The third film takes place in 1988, when Katie and Kristi were kids. While trying to get video proof of Bloody Mary, Katie and Kristi are first confronted by the monstrous demon haunting them in the first and second movies along with their family. Check out two of the static-filled videos after the jump, and catch Paranormal Activity 3 in theaters on October 21st.